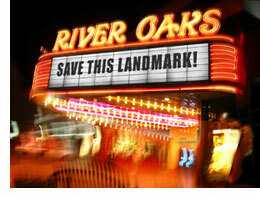 Rumors are flying about the impending loss of two of Houston's landmark buildings, the former Interstate River Oaks Theatre (now operated by Landmark Theatres) and the Interstate Alabama Theatre (now a Bookstop location). Property owner of the land upon which the theatres sit, Weingarten Realty Investors, is mum about its plans, but it certainly wouldn't be the first loss of a theater to Weingarten; the Interstate Village was torn down by them to make way for new development in the Rice Village some 12 years ago. Also read about the sad state of our city's preservation laws.